What am I searching when I use the at OSU Libraries scope? How do I get a book from another library? Use the At OSU Libraries only scope to locate the books, government documents, DVDs. maps and other resources held here in the OSU Libraries. Once you search the OSU Libraries scope, you can refine to a resource type (books, ebooks, journals, maps, etc.) to help make your search more specific. Choose the At OSU Libraries only scope to search all of the OSU Libraries collections. This includes Guin, Vet Med, and OSU Cascades. This option is available after you enter your initial search terms. You can request a book from another library if the OSU Libraries' copy is out or if we don't own a copy. If the availability of the items says Request this Item, that means we either do not own the item or it is currently checked out. If the book is available in Summit (our Washington-Oregon-Idaho consortium), you will see a Place Summit request link in the Get It section. Click on the link and select a pick-up location. If the book is not available in Summit, you will see a link to place an Interlibrary Loan request. Click on the link to place the request in your Interlibrary Loan account. Sometimes you may see a Get it link instead, click on the link to request the resource. Click on the Online Access link to access the content. If you are in the full record, click on View Full Text in the View It section. Be careful to include spaces only where they are needed. 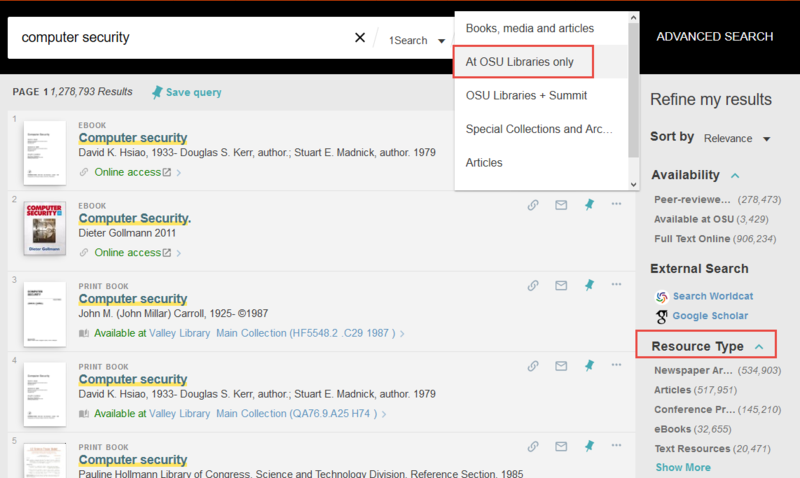 To narrow your search to only OSU Libraries, choose the At OSU Libraries only scope to search all of the OSU Libraries collections. This includes Guin, Vet Med, and OSU Cascades. Use the facets on the right-hand side of the page to choose "book" as the content type you want to see.